A Year of FHE: Sponsor Spotlight // LOVE PRAY TEACH - Awesome LDS Printables and Teaching Aids! Sponsor Spotlight // LOVE PRAY TEACH - Awesome LDS Printables and Teaching Aids! Love Pray Teach offers unique and engaging lesson helps for teachers in The Church of Jesus Christ of Latter-Day Saints! Each of us have been called as a teacher. This ranges from being a Visiting Teacher, Mother, Youth Sunday School Teacher, Primary Teacher, Young Women leader, a Relief Society Teacher, and everything in between! My oldest daughter just started Young Women's this year and I have LOVED this new milestone. She is one of those 12 year olds who delights in all things black (ha!). I really loved that this YOUNG WOMEN'S 2017 THEME PACK came with so many options, including a simple black and white banner! 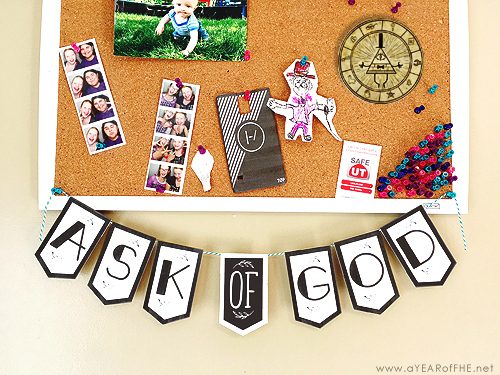 She has a cork board in her room and I simply printed this banner on my home printer and added it along the bottom as a simple reminder of her divine right to "Ask of God". 1. You can buy individual lesson packets in Our Lovely Store. This is a great option if you're only teaching once a month. 2. They also offer a popular membership program! If you are teaching more than once a month, a membership is a great way to save money! For a low monthly price, you get access to all the lesson packets each month in a category! I had so much fun looking through the lesson helps in the Love Pray Teach shop! You can see from the products I chose above that the quality you get is amazing and you get so much product!!! (1) This Relief Society Obedience lesson pack is all about living the gospel. I absolutely love the floral theme and this would truly enhance a lesson! (2) I chose this Baptism Pack because even though it goes with a certain Primary lesson it could be used at home to celebrate your child about to get baptized or for celebrating kids about to be baptized in Primary! (3) These lesson handouts for YW about the Priesthod Keys are so gorgeous! I love this lesson since I don't know if I really understod what the Priesthood "Keys" were until I was a missionary.